Every day thousands of new resumes appear on the job sites. They are all very different. And it's often difficult for employers to choose the only candidate for an open job. 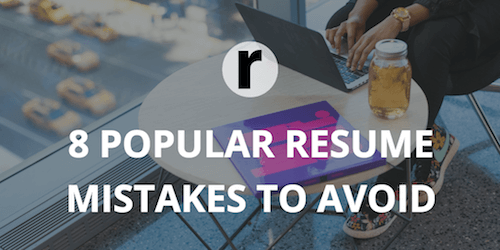 So that you can stand out among other applicants, Resumance recommends to check carefully if there are any common mistakes in your resume. Let's start with the "hot" topic: responsibilities and achievements at the previous (current) place of job. This is what you're directly engaged in and what you've achieved at work. There is no need to rewrite your job descriptions of an accountant or a marketer. This is not interesting to read! Hundreds of applicants will write that way. Find your "schtick". The prestige of your university for employers is far from paramount. What matters is what knowledge you got during your studies. Can you apply them in practice? Could you finish the university, thereby completing one of the important life projects? Therefore, don't just write the name of the university and the terms of study in it. But also write a few words about what you got over the years of study. If you're applying for the position of accountant, and in the column on additional education you tell about yoga courses, it only distracts attention. Of course, you can show yourself as a versatile person. But it's better to reserve this information for the interview if you are invited to a meeting and asked about a hobby. Here it becomes more interesting. Perhaps you'll be shocked or disappointed. But the skills of working with MS Office, Internet Explorer and a printer aren't what recruiters expect from you. Now it's 2017. And if you haven't yet learned how to work with Word or make phone calls, it's strange that you could even write your resume. For all office staff, to describe such skills is ridiculous. And if you're applying for a driver or an electrician, you simply will not need them, so do not mention them. Our advice to you, if there is no particular information that you you'd like to convey to the employer, do not write anything. Better - nothing, than "stress-resistance and sociability". This is not a big mistake but an obvious flaw on your part. If you already have work experience, why not use it? Don't hesitate to ask for advice from former employers. Write the name and position of the person who can recommend you in case the recruiter wants to know more about you. This is a perfectly acceptable practice which at the right time will play into your hands. So, we talked about the contents of the resume. Now let's move on to its appearance. To begin, answer the question, how can you easily perceive written information: in a structured form or in solid text without paragraphs, indents, lists and tables? Fill each section separately. Nobody wants to search for rational valuable grain in the husks of crumpled phrases and sentences. This is a resume title of the multitask specialist. Why not? Why write a separate resume for each job, if you can kill two birds with one stone? Don't do it this way. With this summary, you show the potential employer that you're ready to take on any work that will be offered. So, you're not of special value as a specialist and you will agree to a low payment. So take note: one resume for each vacancy.